Master Series safes boast the same Double-Step™ door design, beautiful radius edges, and size options as those of the Supreme Series. 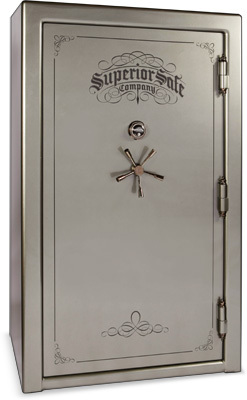 These stately safes come equipped with ASME certified fire protection at 1500°F for 90 minutes. Their 11 gauge exterior serves as the finishing touch for a safe that is king of its class. M-50 44"×721⁄2"×27" 11 ga. 30" 50 CF 1150 lbs 18–11⁄4" 3⁄8" 2"
M-40 38"×67"×26" 11 ga. 30" 40 CF 1050 lbs 16–11⁄4" 3⁄8" 2"
M-25 32"×601⁄2"×24" 11 ga. 30" 25 CF 850 lbs 16–11⁄4" 3⁄8" 2"